Over the 67-year span the Haddonfield Little League program has been around, it has earned a spot in the state championship game twice. The Haddonfield 11-year-old Little League team celebrates their Section 4 Championship win. The Haddonfield 11-year-old Little League squad did a lot of celebrating this summer. Besides winning district and sectional titles, this group of 13 youngsters also accomplished something that is extremely difficult to do — earn a spot in the state championship game. Over the 67-year span the Haddonfield Little League program has been around, it has only happened twice, with the most recent occasion taking place Aug. 5–10 at the Mt. Ephraim Little League field. Haddonfield lost the final game of the double-elimination tournament to Toms River, 4–3, on Aug. 10. The four-team bracket also included the Randolph and Rutherford Little League squads. Haddonfield opened state play with an 8–7 victory over Randolph, followed by a 14–12 win over Toms River. The latter team went on to win the elimination-round contest to set up the rematch. The Central Jersey-based squad went on to defeat Haddonfield, 7–1, to set up the best-of-three scenario. While winning is usually the preferred result, it’s not a subject Narducci stressed to his players during the season. The state tournament served as the final leg of the championship stretch that started in June. 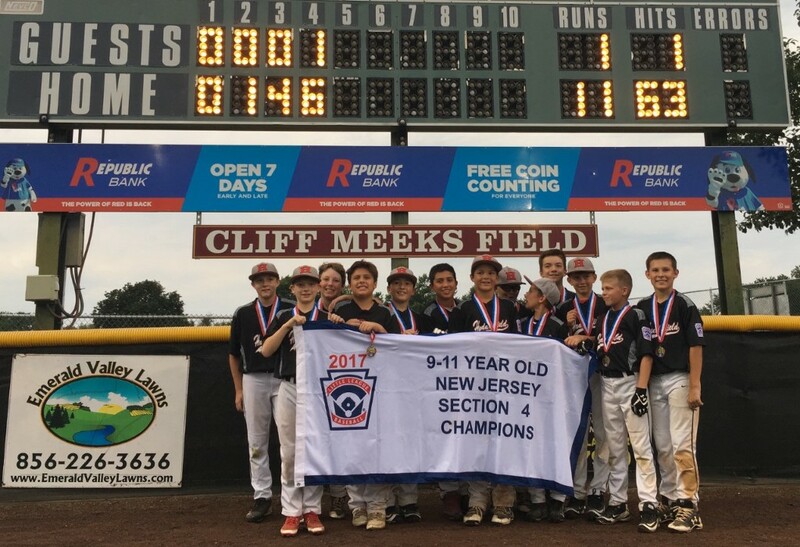 They defeated Cherry Hill American, 15–2, in the 9–11 year old New Jersey District 13 Championship tournament in which they finished with a 5–0 record. Next up was the Section 4 Tournament in which Haddonfield finished with a 9–0 record, and includes an 11–1 win over Blackwood in the final. Sam Carlson, Holden Fichter, Matt Laprocido, Declan McCarthy, Nik Mehta, Sammy Narducci, Jack Petrillo, Raffaele Rogers, Patrick Ryan, John Sheehan, Jack Submaranian, Ian Talty and Joey Tedeschi each made significant contributions throughout the memorable run. Coaches Blair Talty and John Laprocido provided valuable support and guidance from the bench. The league commissioners, parents and endless list of volunteers also played a role in this success story. The backing of the town was quite clear in Mt. Ephraim last week when some 200 supporters showed up to cheer on Haddonfield. Besides making it to the final game, this group of 13 boys proved they were ready for any challenges that came their way. Narducci would stress to his players that “everyone is here to pick each other up.” It included each of them knowing what they were supposed to do and what their respective jobs were at each position. While this talented group of youngsters prepare for the first day of middle school, it’s hard not to start thinking about next summer. Narducci has coached this group for the last two summers. While he will not know until next year whether he will return to manage this squad, he will at the very least be rooting for them from the sidelines. “I am looking forward to next summer,” he said.